The IPCC says action on climate change is urgent but affordable. The Abbott government says it will "wait and see", all the while dismantling the mechanisms that could achieve higher targets. The IPCC report says climate change impacts are occurring now, and the risks of greater impacts need to be managed. The fossil fuel industry relies on politicians and business to ignore those risks. Nearly 80% of the world’s energy needs could be met by renewable energies by 2050, according to a new report by the Intergovernmental Panel on Climate Change (IPCC), writes Amber Jamieson. It’s been a gloomy year for the UN’s Intergovernmental Panel on Climate Change (IPCC) and a damning review of its processes and procedures released this week wouldn’t have helped lift the fog. Amber Jamieson explains. Reading some of the media coverage on the report into the Intergovernmental Panel on Climate Change, you'd think it had condemned the IPCC for gross misrepresentation of the climate science. Climate scientist Andrew Macintosh cuts to the truth. 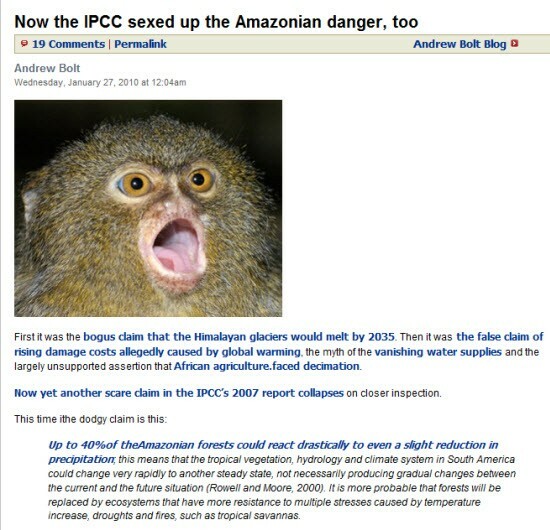 The Sunday Times has apologised for its sham IPCC ‘Amazongate’ story. But will The Oz, the ABC, Fairfax and many other outlets do the same? The entire field of climate research is facing a crisis of confidence, says Der Spiegel. Can scientists save themselves in time to save the planet?